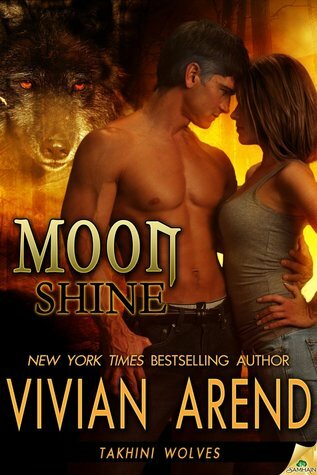 Moon Shine is the latest in Vivian Arend’s Takhini Wolves series, and it is set in the world Ms. Arend has built so well. The characters are well developed and personable, folks you’d like to sit and share a meal and good conversation with of an evening. I enjoy visiting this world, and have spent many evenings visiting with the people that live and love in this place. Ms. Arend combines humor and romance in a most unique manner with her wolves, and I look forward to each of her new stories. As Alpha of the Takhini Pack, life is usually pretty smooth for Evan Stone. But recently, things have really gotten crazy. First, Caroline went off and got married, leaving her job as manager of most of the packs holdings. Then, Evan got a whiff of his long sought mate, but can’t seem to find her anywhere. Finally, things have gone haywire in all the pack businesses and Evan is told that what was supposed to belong to the pack, doesn’t anymore. Add to that the stress and negotiations of trying to unite the two Whitehorse packs into one unified group, and Evan is really going crazy. Amy Ryba has been wanting revenge on Evan Stone for years, and now, as Alpha of the Canyon Pack in Whitehorse, she is set to put her schemes in motion. He will pay for what he did. But things get complicated when Amy discovers that, of all the wolf shifters in the world, her one destined mate is Evan Stone. When Amy confronts Evan with who she is and why she is out to ruin him, can she accept his reasons for his actions and finally let the past rest in peace. Or will she do the one thing that is almost unheard of in shifter society…reject her mate? Can these two resolve the past and unite the packs to the benefit of everyone? Amy Ryba is smart, strong and determined to make Evan Stone pay for the pain of her past. She is willing to do whatever it takes to get the revenge she feels is her right, but once she meets Evan, she realizes he is her mate, and she must decide whether she should learn why he did what he did and learn to accept, or turn her back on the one true mate she will ever have. I like that Amy was smart enough to give Evan a chance to explain his actions of the past, and was open minded enough to realize things were not exactly what she had always believed. I like Amy’s sense of loyalty to her friends, and her determination to see that her pack is not ignored in the overall scheme of things. Evan Stone is strong and easy going, a born leader and Alpha of the Takhini Pack. He is also tortured with nightmares of his past, a past that haunts him and formed his protective nature. He has waited for his mate, watching the rest of his friends find love, and wanting more. He wants to strengthen the two Whitehorse Packs, uniting them into one integrated group. I liked watching as he realized his mate was near, and the things he was willing to do to find her. I liked Evan’s patience when he found Amy, and discovered what she had done in the name of revenge. I also liked that he was willing to open up old wounds to try and put the past behind for Amy as well as himself. There is suspense, humor and romance in this, with lots of ingenious tricks from Amy and her techno wolves of the Canyon pack, all aimed at Evan and the Takhini Pack. When a serious threat to both Amy and Evan arises, they need to learn to function as equals and as Alphas to keep disaster from ruining both packs forever. I had some giggles and laugh out loud moments here, and some tearful ones as well. The romance is slow to build, but once these two get together, the heat goes off the charts. I recommend this one to shifter lovers and anyone who likes a bit of laughter with their loving.